CAPITOL HEIGHTS, Md. 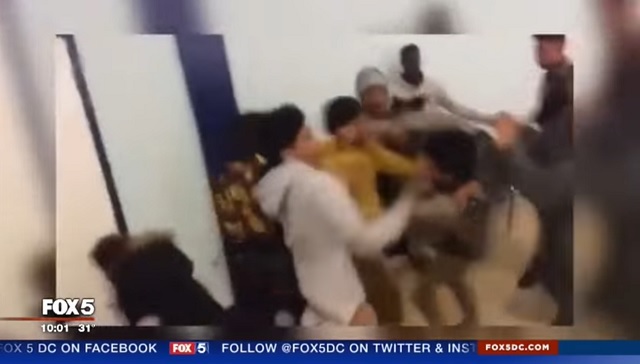 - A brutal fight at a high school in Prince George’s County put three students in the hospital on Friday. The lunch room brawl at Central High School was caught on camera and shows a large number of students attacking each other as three adults try to break it up. A spokesperson for Prince George's County Public Schools said a group of African-American students assaulted a group of Hispanic students. Spokesperson Raven Hill told FOX 5 that the principal is working with the school district's diversity officer to bring students together and "developing a plan of action that addresses students and parents' safety concerns and encourages students to celebrate cultural differences in the wake of this incident." No doubt having these youths "celebrate cultural differences" will solve everything. If the slogan "our diversity is our strength" is just repeated a few more thousand times we'll all be living in a multicultural utopia and people will feel just as safe living in Detroit as they do in Manchester. President Obama said Monday it's "inevitable" the U.S. will become "browner." "With respect to how we deal with each other, the demographics of the country are going to change," he said. "It's inevitable." "The Latino community in America is going to grow," Obama said. "If you stopped all immigration today, just by virtue of birth rates, this is going to be a browner country." 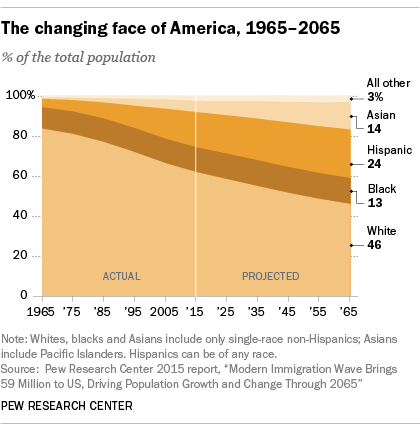 We may need to invest in a lot more "diversity officers" if these demographic trends are not reversed.